Are Financial Advisors Worth the Investment? Thanks to a number of recent national and international research studies, we can now give a scientific, evidence-based response to this question. And the answer is a definite "yes." In a publication called The Value of Advice Report 2012, the Investment Funds Institute of Canada (IFIC) provides an overview of relevant research conducted in Canada, Australia and the United States. In particular, it points to a ground-breaking scientific study by the Montréal-based Center for Interuniversity Research and Analysis on Organizations (CIRANO). 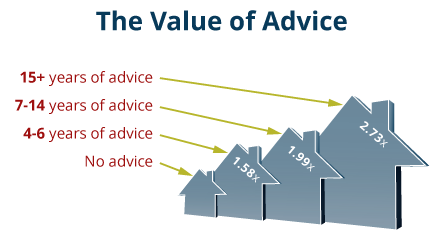 Titled An Econometric Analysis of the Value of Advice in Canada, the study takes investigation into the value of financial advice to a new level by using econometric modelling* and a robust sample of Canadian households. In their conclusion, the researchers say the evidence demonstrates convincingly that having a financial advisor contributes positively and significantly to the accumulation of financial wealth. Having advice is an important contributor to levels of trust, satisfaction and confidence in financial advisors—a strong indicator of value. With the health of the global economy in question and traditional pension plans under pressure, Canadians need to assume greater responsibility than ever for their future financial security. A small percentage of people have the knowledge and time to follow the market and make investment choices without the help of a financial advisor. For most investors, however, a mounting body of research evidence indicates that professional financial advice is vital to achieving the best possible investment results. * Econometric modelling studies the statistical relationship between different variables, including causal relationships. It aims to isolate the impact of a specific variable when all others have been taken into account. What Is CRM2 and How Does It Affect Me?